What Causes Diabetes Type I? What Are the Types of Diabetes Type I? What Are the Symptoms of Diabetes Type I? What Are the Diagnosis & Tests for Diabetes Type I? What Are the Treatments Available for Diabetes Type I? How Do You Cope Up with Diabetes Type I? What Are the Ways to Prevent Diabetes Type I? Type I Diabetes is an autoimmune disorder in which the pancreas produces little or no insulin. Insulin is a hormone that is needed to convert sugar (glucose), starches and other food into energy needed for daily life. Although Type I Diabetes can develop at any age, it typically appears during childhood or adolescence and hence called as juvenile diabetes. Type I Diabetes is known by a variety of names like insulin-dependent diabetes mellitus (IDDM), brittle diabetes, and sugar diabetes. There is no defined cause for type I diabetes. Poor diet (malnutrition), genetic, and exposure to certain virus in the environment may also trigger the condition. Another cause could be the secretion of some hormones in blood which act as antagonists to insulin. Some of them include Adrenocortical hormone, Adrenaline hormone and Thyroid hormone. In general, it is said that the body’s immune system which fights against virus and bacteria, attacks and destroys insulin producing cells in the pancreas. There is no reason of why this happens. Insulin allows glucose to enter the cells of the body to provide energy. When glucose cannot enter the cells, it builds up in the blood and the body’s cell resulting in high blood sugar levels. Idiopathic type I diabetes: This is the rarest form of Type I Diabetes with no known cause. This kind of diabetes is mostly found in people with African or Asian ancestry. This form of type I diabetes in also referred to as Type 1B diabetes. Immune-mediated Diabetes: This is the most common form of type I diabetes. This is an autoimmune disorder in which the body’s immune system destroys or attempts to destroy, the cells in the pancreas that produce insulin. It is found that majority of people with type I diabetes have abnormal antibodies. Antibodies are proteins in the blood that are part of the body’s immune system. The patient with type I diabetes must rely on insulin medication for survival. Increased thirst and frequent urination, extreme hunger, weight loss, blurred vision and fatigue are some of the symptoms of type I diabetes. Women might have frequent vaginal infection and yeast infection while men face yeast infection alone. Dry mouth, slow healing of sores or cuts, itching skin, especially in the groin or vaginal area are some of the symptoms of type I diabetes. Seek medical attention if you feel nauseated, week, have fainting spells or breathing more deeply and rapidly than normal. Some people might fell sweet breath like that of nail polish remover. You require medical attention in such cases, which indicates the presence of ketoacidosis, a potentially deadly complication of type I diabetes. Fasting blood sugar test: whereby blood sample is taken after an overnight fast. A fasting blood sugar level between 70 and 100 mg/dL is normal. A fasting blood sugar level from 100 to 125 mg/dL is considered prediabetes, which indicates a high risk of developing diabetes. If it’s 126 mg/dL or above, you are diagnosed with diabetes. Treatments for type I diabetes is determined by your physician based on various factors like your age, overall health, medical history, extent of the disease, and your tolerance to medications and procedures or therapies. Daily injection of Insulin will help to keep your blood sugar level within normal range. Appropriate diet, exercise, and careful self-monitoring of blood sugar levels at equal intervals as directed by your physician becomes major part of the treatment for type I diabetes. Regular monitoring of the hemoglobin A1C levels will also help you keep your blood sugars within range. Insulin and other medications: People with severe type I diabetes needs insulin to survive. 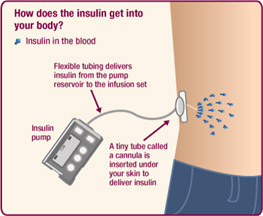 Insulin is injected using a fine needle and syringe or an insulin pen or insulin pump. Oral insulin might interfere with the stomach enzymes and is not prescribed to lower blood sugar levels. Insulin comes in several forms that include rapid-acting insulin, long-acting insulin and intermediate options. Examples include regular insulin (Humulin R, Novolin R, others), insulin isophane (Humulin N, Novolin N), insulin lispro (Humalog), insulin aspart (NovoLog) and insulin glargine (Lantus). Depending on your needs, your doctor may prescribe a mixture of insulin types to use throughout the day and night. Transplantations: Researches have led to improved methods of managing and curing type I diabetes. Some of them include pancreas transplantation, islet transplantation and stem cell transplantation. With successful pancreas transplantation, you would no longer require insulin therapy. Islet cells are special cells in the pancreas that make insulin. Researchers are experimenting with islet cell transplants, which provide new insulin producing cells from a donor pancreas. Stem cell transplantation is little risky since it involves shutting down of the immune system and building it up again. This kind of treatment involves using stem cells made from their own blood.